Saint Anna, the mother of the Virgin Mary, was the youngest daughter of the priest Nathan from Bethlehem, descended from the tribe of Levi. She married Saint Joachim (September 9), who was a native of Galilee. For a long time Saint Anna was childless, but after twenty years, through the fervent prayer of both spouses, an angel of the Lord announced to them that they would be the parents of a daughter, Who would bring blessings to the whole human race. The Orthodox Church does not accept the teaching that the Mother of God was exempted from the consequences of ancestral sin (death, corruption, sin, etc.) at the moment of her conception by virtue of the future merits of Her Son. Only Christ was born perfectly holy and sinless, as Saint Ambrose of Milan teaches in Chapter Two of his Commentary on Luke. The Holy Virgin was like everyone else in Her mortality, and in being subject to temptation, although She committed no personal sins. She was not a deified creature removed from the rest of humanity. If this were the case, She would not have been truly human, and the nature that Christ took from Her would not have been truly human either. If Christ does not truly share our human nature, then the possibilty of our salvation is in doubt. The Conception of the Virgin Mary by Saint Anna took place at Jerusalem. The many icons depicting the Conception by Saint Anna show the Most Holy Theotokos trampling the serpent underfoot. There are also icons in which Saint Anna holds the Most Holy Virgin on her left arm as an infant. On Saint Anna’s face is a look of reverence. A large ancient icon, painted on canvas, is located in the village of Minkovetsa in the Dubensk district of Volhynia diocese. From ancient times this Feast was especially venerated by pregnant women in Russia. 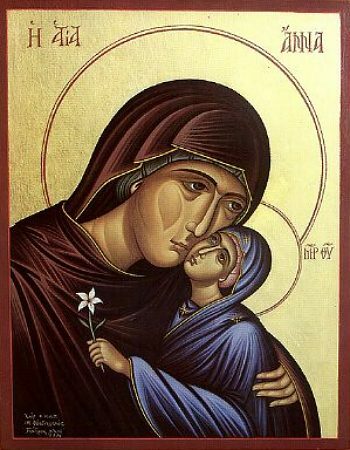 Today the universe rejoices, / for Anna has conceived the Theotokos through God’s dispensation, / for she has brought forth the one who is to bear the ineffable Word!